Imagine an elegant setting with unobstructed sea views, modern facilities, and an inspiring atmosphere awakening your senses. 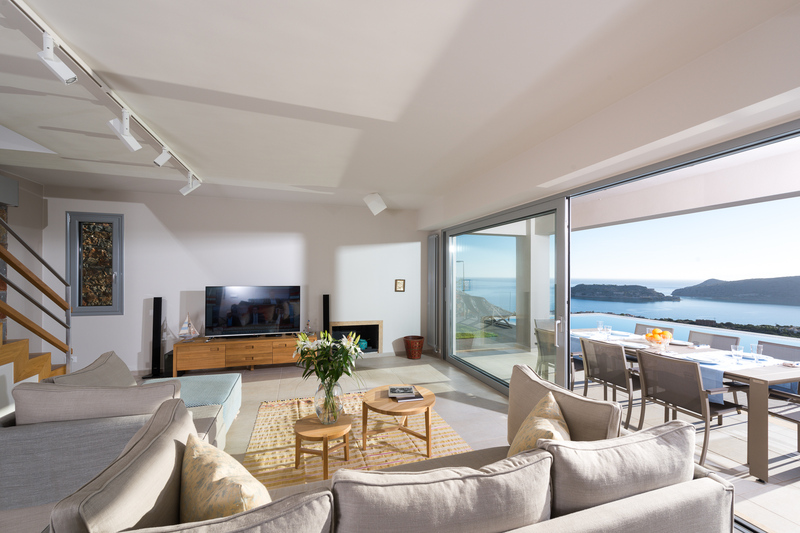 Whatever the purpose of your trip to Crete, you are about to experience an unforgettable stay in the unmatched environment of exclusive Elounda villas. Topaz, Amethyst or maybe both? Amphitheatrically built on the hill and at close proximity to Plaka village, Villa Topaz (upper level) and Villa Amethyst (lower level), our exclusive Elounda villas, provide an immaculate spot for leisure, rest and unwinding in Crete. These smartly-designed, spacious villas (140 m2 each) are nestled at a magnificent panoramic property surrounded by beautiful gardens with trees and aromatic herbs; the residences are in perfect balance with the unspoilt natural surroundings, home to indigenous species of birds and plants. Featuring a plethora of guest-centered amenities including private pools, state-of-the-art equipment, designer brand-name villa furnishings, and hand-picked works of art and décor, including selected pieces from the owners’ family collection, these exclusive Elounda villas are offered for rent either individually or as a complex, and make the ideal destination for families, groups, and couples during their stay in Crete.